Mirrors. It is their job to reveal. Some reveal truths… spotty acne that we wish we could avoid, age lines that shout loudly that we’re no longer in our mid-20s, that one strange nostril hair that can neither be plucked nor ignored! Some reveal a backwards world… letters printed wrongly, changing us from right-handed folks to southpaws. And, still others are reportedly gateways into other realms… Alice’s portal into Wonderland and spirits’ ways into our own realm if mortals are silly enough to say their names three times in dimly light bathrooms. Isn’t the trouble, then, trying to figure out which mirror it is that you’re looking into!? … Your kiddo hasn’t recently been staring into mirrors strangely and giggling with a near demonic cackle, right? If so, you might be just a few seconds away from finding your tyke transformed into a ghoulish beastie with this Child Haunted mirror Ghoul costume. 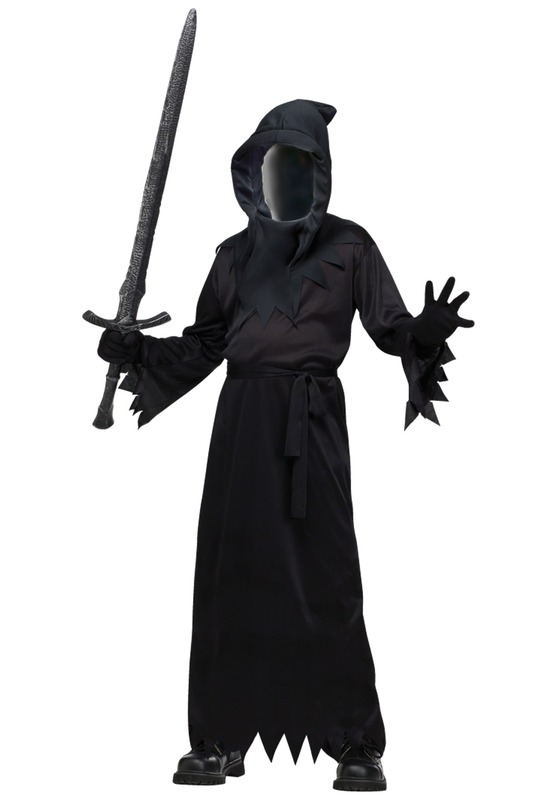 The dark polyester robe has a jagged hemline that speaks of danger and sleeve cuffs to match! Wrist-length gloves engulf your tyke’s hands in darkness, too, but it is the hood with its reflective mask that reveals this ghoul’s true power. Able to see through, your kiddo can see the world while the world looks in and only sees its own face in this dark and frightening robe! The Grim Reaper has never been such a frightening specter, but at least its your own child, so you’re probably safe… right?